These pages have moved to http://www.nwsprints.co.uk where there are no annoying adverts, pop-ups or spyware and it responds quicker too! Three Sisters is another excellent sprint course near Wigan. 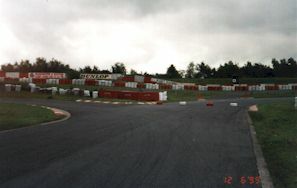 Don't let the fact that it is a kart course put you off - it has a good mixture of fast and slow sections and some gradients which add interest. 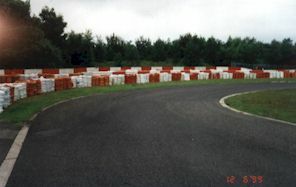 It is used as a round of the British Sprint Championship. You also get motorbike sprints there. It's also available for testing and represents pretty good value at about �30 for a couple of hours. If you want some expert tuition on the course then try the confusingly named Aintree Racing Drivers School (which is at Three Sisters). For another view of the course see the Longton Website. See also Stephen Miles in-car video at: http://www.moleracing.com/Videopage.html. The photo above is courtesy of Pennine Motor Sport. It shows Graham Sherwood's Megapin and looks like it is coming down the hill from "coward's leap" and entering the 90 right in front of the pits. The start is clean, grippy and flat. You get up to third before the first right hand kink and it is possible to take this flat in some cars - but its best to start the day by lifting until you are confident in the surface. The road starts rising before you come off this kink, so the suspension loads up making for an interesting exit. Going up the rise you can get up to 80-90 in a Mallock and 105-110 in a top sprint car. Next comes the crassly named "coward's leap" - can't we rename it something more evocative like "wheelchair"? (didn't Stirling Moss have some advice about only being brave on safe corners?). The hollow on the outside near the Marshall's post has gone since it was resurfaced and this is just where you ought to be for a good line. The bend itself is a blind crest which goes round to the right and the car goes light. It is not too tight and is truly exhilarating - a real rollercoaster. What I don't like is the lack of run-off . You get stacks of tyres about 4-deep protecting the earth bank/Armco. You then go quite steeply downhill briefly before a tight, second gear 90 right with saw-toothed kerb on the outside which you can ride up. but it is great fun slingshotting out of it - that outside rumble strip really leaps out at you. Then there is another short blast up to a tricky 120%? lefthander. This goes a little off-camber on the outside of the exit and being the first lefthander your offside tyres are still cold. I used to take this in first as the 1300 bogged down, but with a bit more torque, second is just about OK. There used to be a concrete marshall's post on the outside of the exit. I thought this rather poorly sited and attempted to remove it on a practice day with the Mallock. 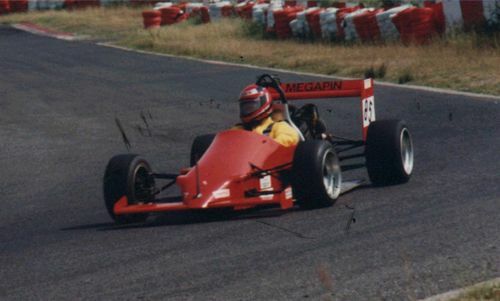 Luckily I had side pods on - otherwise it might have removed the back axle if it had hooked onto it. I've also seen two-wheeling saloons decide to drive behind that post rather than into it. Thankfully this post has now been re-sited. After another brief straight you get an interesting sequence of a left followed rapidly by a right-left chicane. I guess this is the most technical part of the course as you try to find the right line. I believe you need a late apex on the lefthander so you can position yourself nicely on the left of the track for the right-left chicane. Don't ask me where you turn in for the right hander. 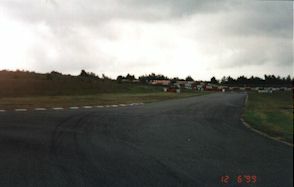 However, a good speed through the first two bends can result in a spin on the final lefthander, especially when it's wet. I've found myself straddling that outer rumble strip more than once. It doesn't do the undertray much good and makes you think you should have put a piece of kevlar to protect your bum! It is also pretty irritating if you have had a good run up 'till then as the finish is only 50 yards away. However, I think most of us just enjoy taking a bit of kerb and pretending to be Schumacher/Senna/Prost/Clark/etc depending on age. OK you've made it and can start breathing again now. A second permutation starts from the pit lane onto the 180 degree right-hander. One pretty obvious difference is that you can't accelerate flat out into a bend, so I use a lot less revs. I think it's also a good idea to keep wide for as long as possible, but I haven't really got the hang of it yet. 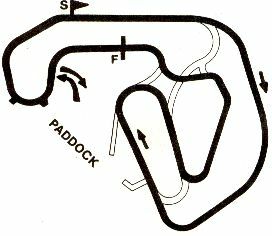 I don't think you take any of the following bends up to and including the esses any differently but instead of finishing after the second ess you continue into the following tight lefthander. I think it's worth sacrificing some line on that so you can keep left for the following right-hander. Obviously there is a correct line around the following set of right hand chunks but I haven't found it yet. Since you come onto the straight rolling along in second you easily make top before you reach the right hand kink so there is no way you are going to get around this with just a lift when the course is run in this fashion. It's very scary in the wet and you can be well out of shape before you reach the timing beam. One advantage of this layout though is, if it is raining you are spared having to go over the top. Another permutation is a 2-lapper, but as I've never tried that I can't comment. Course layout - nicked from someone's regs. - hope that's OK. See also the BMRC page. High grip = high G-forces. Watching other people coming over the top. I prefer more run-off personally.